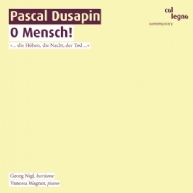 Georg Nigl and Pascal Dusapin are united by a bond of artistic friendship: They had already collaborated in two opera productions before embarking on the challenge of creating a lieder cycle. For this venture they also took the wonderful pianist Vanessa Wagner on board. When listening to the end result we are left with the intriguing impression that the three musicians share a secret, which shines through their music but can never be fathomed in its entirety. The lyrics of O Mensch! are based on selected poems by Friedrich Nietzsche. Mysterious, poetical, masterly: Listen to this recording and witness the documentation of an extraordinary encounter. “I do not put my trust in tech-niques but in listening with the inner ear.” Music that gets to the point is the utmost concern of Katia Tchemberdji whose ways to get there are manifold.